Francis Stillwell Dixon was born in Queens, New York in 1879 into a very prominent and wealthy family. He was one of ten children and by the age of 20 he was already recognized as an accomplished artist. 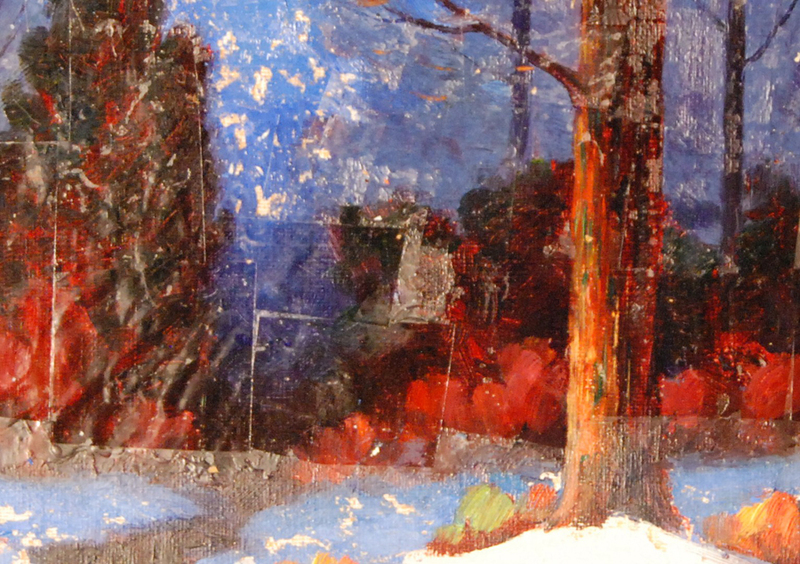 He studied under noted artists such as Robert Henri and Herbert Twachtman at the Art Student League of New York. He worked as an illustrator for magazines and occasionally wrote articles himself. He was married twice, first to a woman in 1915 in California who divorced him in 1925 in Paris and then to Emilie McMillan who survived him at death. He painted in Carmel and Point Lobos while in California. He then traveled to Bermuda, Great Britain and Europe to paint during the mid-1920’s and then settled in New York City by the 1930’s. 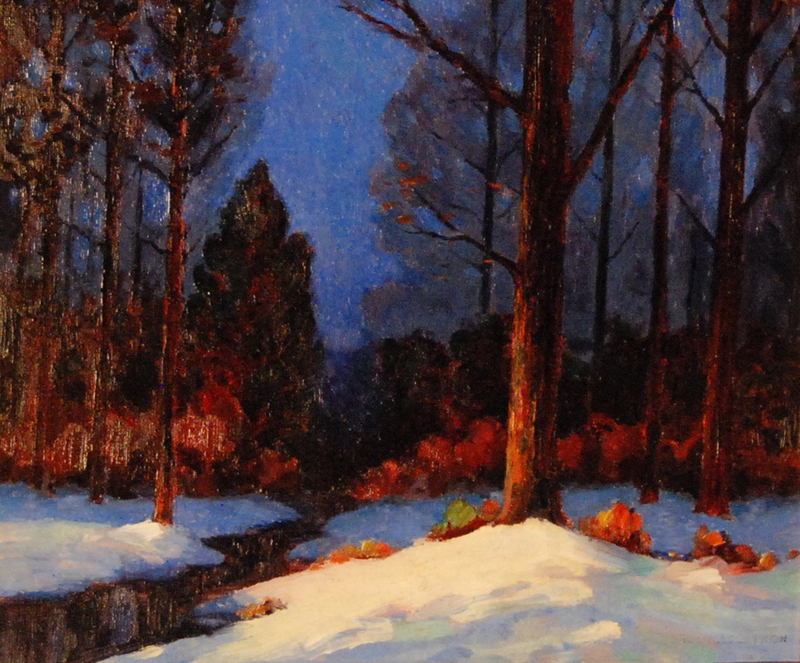 Dixon became a notable artist of landscape paintings exhibiting in many galleries and museums including the Salmagundi Club in New York City and the Corcoran Gallery of Art in Washington, DC. He died in his residence in New York City in 1967 at the age of 88. 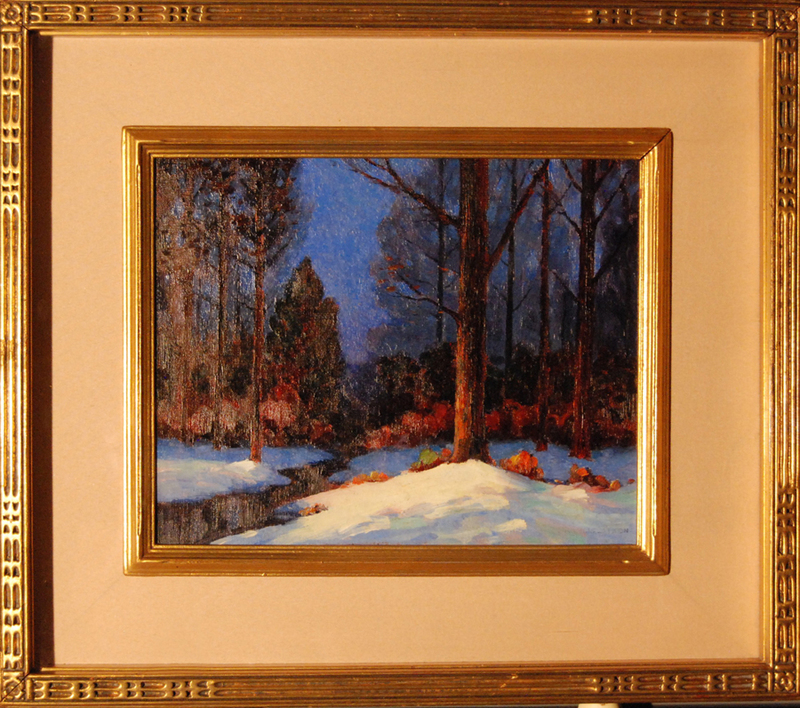 This painting that we treated entitled “Winter Evening” was painted in 1928 and was in an exhibit of decorative arts at the Salmagundi Club in New York City originally listed for sale at $50.00. 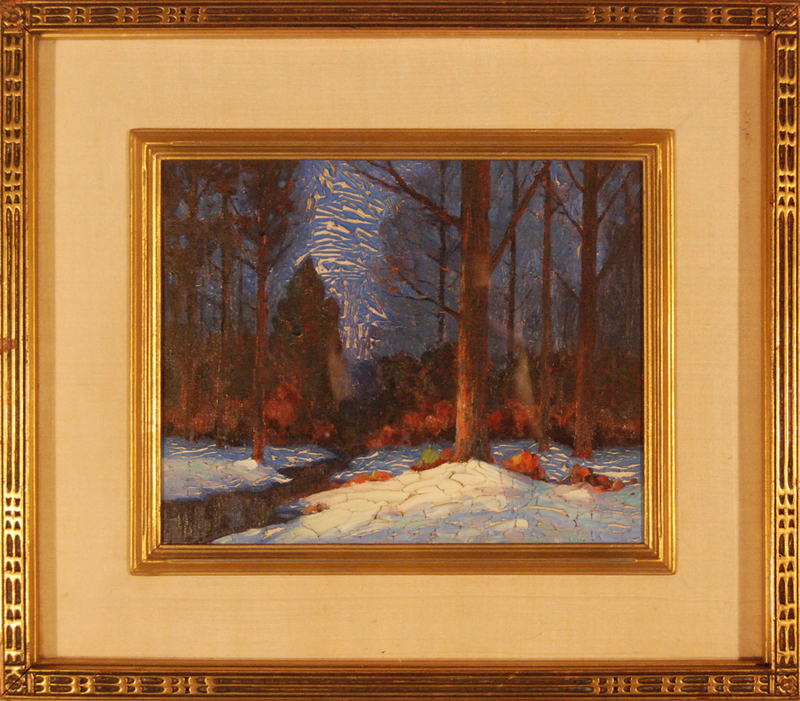 The location of the woods with the stream is not noted on the painting. The canvas board on which the painting was executed was purchased from Winsor & Newton “Artists’ Colourmen to their Majesties the King and Queen” in London England. It’s interesting that the Windsor & Newton stamp on the canvas board backing notes that this is a “2nd Quality” product. The “Winter Evening” was painted using oil paints on a white pre-primed canvas board. The painting measures 8 1/8”h x 10 1/8”w. The canvas board was bowed concavely and was out of plane slightly. It was framed in a period Art-Deco gold leaf frame with an acidic corrugated backing board attached to the reverse side with animal skin glue. The bowing of the canvas board was a direct result of extreme changes in humidity particularly because of the cardboard backing attached with the animal skin glue. The damage may have occurred simply by the fact that the painting was hung on a damp exterior wall. This bowing canvas board was the major contributing factor to the paint layer delaminating from the ground below. About one half of the paint was actively flaking to the point that the paint chips were almost curling back on themselves. 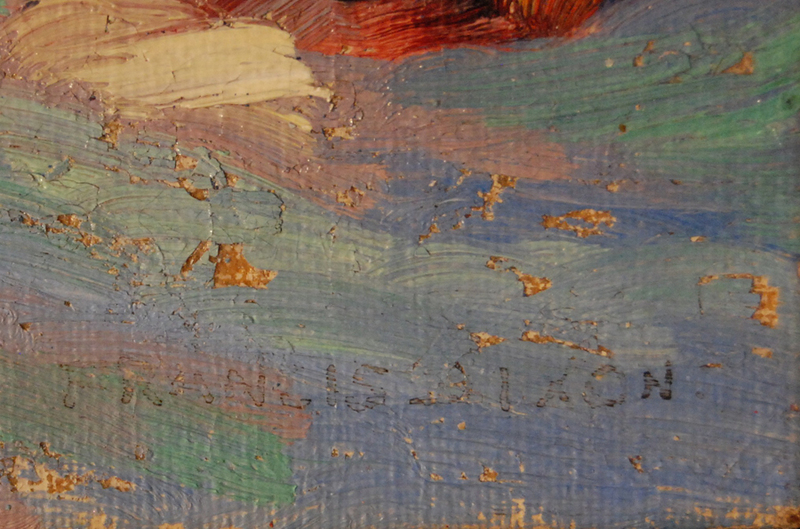 There fortunately did not seem to be any significant paint loss with the exception of Francis Dixon’s signature and date in the lower right corner of the painting which had significant damage with only the outline of the painted letters remaining intact. It appeared that the signature may not have been painted directly into wet paint, which would have precluded it from damage of this type. There was a fairly thick discolored layer of natural resin varnish over the paint layer. In its present state it was not possible to remove this layer safely until the paint was completely consolidated back into place. The gilded frame has a light layer of surface dirt and grime. It has a few minor abrasions, nicks and scratches on its surface. The painting has a linen covered wooden liner or spandrel that has a decorative gold-leafed molding on the inner edges. The liner is dirty and somewhat stained. The conservation treatment was documented with written reports and was photographed before, during and after treatment. Treatment began with the unframing of the painting. Extreme care was taken to unframe the painting face up because of the severely compromised condition of the paint layer. Curling, flaking, delaminating paint was carefully relaxed and reattached to the ground layer below in small 1 ½” square sections. Melted wax resin adhesive was thinly applied to a sheet of silicon coated clear Mylar. Once dry, the coated sheet was cut into small squares. With the aid of a temperature regulated micro tacking iron the coated Mylar was carefully placed over a section of flaking paint. With the aid of heat (not pressing it down) the wax resin mixture slowly melted around the section of flaking paint. When saturated, light pressure was applied from the tacking iron and the paint uncurled and flattened back into its original position. This was repeated with about 50 pieces of coated Mylar until the entire painted surface was secure. When the wax resin was cooled the silicon coated Mylar easily peeled off and the wax resin coating was removed with a mild organic solvent. The painting could now be cleaned safely and the discolored varnish coating was removed with organic solvents. Detailed photographs were made of the signature before, during and after cleaning to show that no paint was lost because it was barely visible and intact before treatment. Signatures on paintings are extremely important to the monetary and intrinsic value of a piece of ar, and to its historical provenance. We are particularly careful when cleaning a signature or inscription on a painting frequently leaving it to be the last part cleaned so that we completely understand how cleaning solvents affect the varnish layers and paint. This signature was painted on top of dry oil paint so that it didn’t stick well to begin with and that’s why it was flaking. A signature that is not applied directly into wet paint could be indicative of a signature added by someone else than the artist, but that is not the case with this painting. This signature looks like Dixon’s signature and is confirmed by the early Salmaguni Gallery exhibition label. A spray applied isolating varnish layer was added to separate work that we do from that of the artist’s. Losses were filled with gesso and inpainted with conservation grade paints mixed in a mineral spirit base. A final spray coating of varnish was applied. 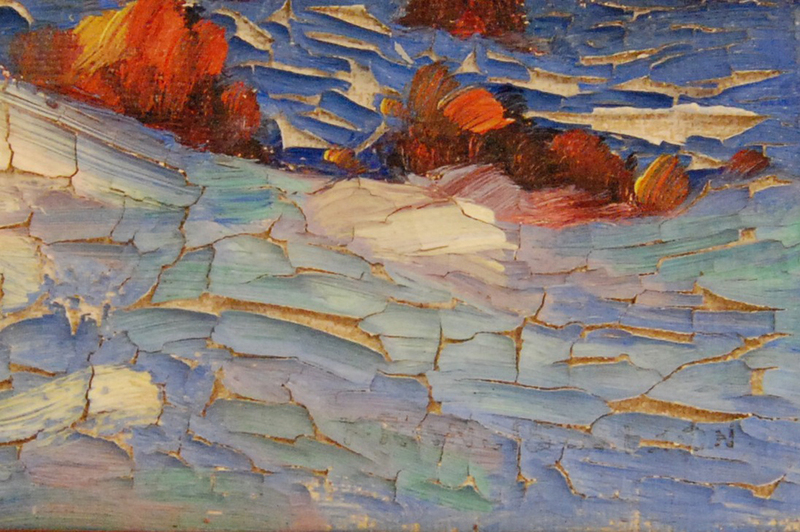 Following consolidation, cleaning and varnishing of the painting, the corrugated cardboard backing was removed. The backing was partially detached showing signs of large amounts of animal skin glue on the back and some areas of torn brown backing paper on the canvas board. When removed two paper labels unknown to the present owner were discovered. One noted that the painting had been displayed at the Salmagundi Club in New York and the other that the canvas board had been produced by Windsor & Newton, Ltd. of London, England. The frame was lightly surface cleaned with a mild detergent and then rinsed with distilled water. Minor nicks and scratches were inpainted with mica powders mixed in varnish. It was decided that the linen on the frame liner could not be adequately cleaned and was recovered with a new piece. 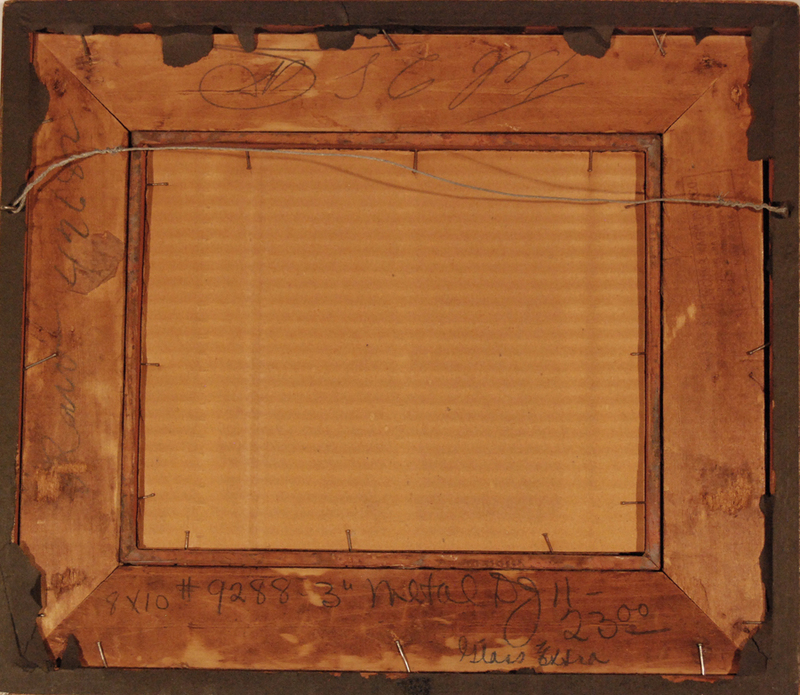 The reverse of the painting was covered with ultraviolet filtering clear acrylic sheeting to protect the labels and placed back into the frame secured with brass mending plates, new braided wire and “D” ring hangers.